A Day in the Life of a Working Dog - The Turtle Mat Blog - For news, features and competitions! The Turtle Mat Blog – For news, features and competitions! Rebecca Wilson on the subject of Paws for Thought. Posted on February 21st, 2014. With Crufts just around the corner, the nation’s top show dogs are busy preparing themselves for what might be the biggest moment of their careers. These hardworking dogs deserve every award that comes their way, but what about the everyday hard-working dogs that aren’t up on stage? In celebration of all the amazing work that dogs in the UK are doing for so many people, we spoke to a select few to find out what they really do, what makes them tick, and how they got to where they are today. When you’re done, why not check out our range of pet mats? What are your day-to-day duties? Did you need any special training to become a therapy dog? I did have to pass a test to become a PAT dog. This entailed meeting an assessor in a very busy and noisy supermarket car park where he watched me interact with strangers, he made loud and sudden noises to see if I reacted in a negative way and gave me a treat to make sure I didn’t grab. Being a finalist in the PAT Dog of the Year 2013 at Crufts was a great experience because not only did I get to strut my stuff in the centre ring and tell everyone what a fab job I have but I got a trophy and a rosette too and Katie my owner or as I prefer to call her, my friend, got a cheque for £100. I also got to stay in a hotel. Crufts was brilliant but I think my proudest moment was being chosen to be photographed by Rankin the celebrated Photographer for a photo shoot for the Dogs Trust who I am very fond of because they took care of me when I had been found wandering the streets in a very sad state, undernourished and wounded. The photos and article were in the Sunday Mail You magazine. I was very happy to be an ambassador for the Dogs Trust. What on-the-job perks do you enjoy most? The biggest perk is actually having a job I love and everyone being happy to see me, and the cuddles and treats of course. Likes: Squeaky toys, picking strawberries, sleeping under the duvet, emptying the washing machine, going to the Support Dogs training centre and getting lots of cuddles all day long. Dislikes: Getting up before lunchtime, going out in the cold or rain, people who don’t look where they’re going, being picked up and having my ears played with. I usually wake my partner Carol up at 9 am to remind her to take her medication, then fetch her slippers, pull the quilt off her and give her a big sloppy kiss. Carol has a form of chronic fatigue, arthritis and problems with mobility. I help her dress, fetch the post, let the cats in and out, find the phone when it rings, do the laundry, tidy up after the cats and any other tasks she asks me to do. When we are going out, I fetch the keys and her shoes, then I look after her whilst we are out, accompanying her everywhere she goes. When we return home, I help her unload the shopping, open and close the doors, turn the lights on or off and then make sure she gets to bed safely at the end of the day. This means Carol doesn’t have to rely on other people to look after her. 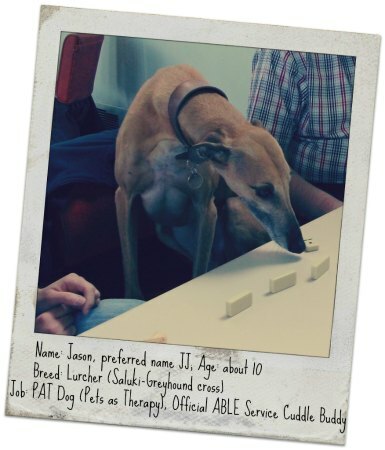 What attributes do you consider important for your role as a support dog? Patience is important, especially when we’re out in public and people keep stroking me and pulling my ears or tail. I must be focused, as many people do not know they shouldn’t distract an Assistance Dog. It’s very easy to be distracted from my work when people are trying to get my attention but I must ignore them and concentrate on my partner. I also need to be able to adapt quickly – one minute I’m working with my jacket on, then the minute I could be doing task work in the house or, when my jacket is removed, chasing tennis balls and playing with other dogs in the park. Most of all, I need to be able to enjoy life as being a Support Dog is a lot of fun! What training is involved to become a support dog? 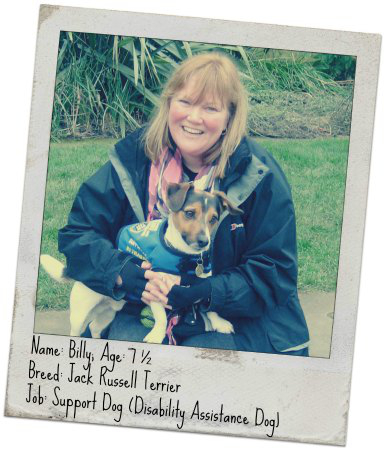 Before I started my career with Support Dogs, Carol took me to puppy class and made sure I was well socialised out in the community. This gave me a good start in life and it is something I recommend to all puppies out there. When I reached around 18 months old, I started going to Support Dogs training centre in Sheffield to start training with the big guys. It was a bit daunting at first seeing all the big dogs who knew what they were doing, but all the staff made me feel very welcome and gave me lots of cuddles. The training was great fun and we played lots of games. They soon taught me how to behave like a professional in public, how to solve problems and how to do the tasks that my partner needed help with. It was all so exciting and I made lots of great friends. After a few weeks, Carol came for her training and I could show her everything I’d learnt. She didn’t learn as fast as me but eventually she made the grade too and I received my Support Dogs blue jacket. When I put it on, Carol said it was the proudest moment of her life. Who is your dog role model? This is an easy question for me. It’s every other Support Dog, Assistance Dog or working dog that I have met along my journey. They are all heroes in my eyes, just like all the people at Support Dogs. An established Canine Partner, Ulli’s secret to a long and rewarding career has been being lucky enough to do something he truly loves and getting the work/play balance right. First thing, I get up on the bed for morning cuddles. I have my partner wrapped under my paws!! I help her get up out of bed. Then off I go out to toilet in my own patch, before coming back in to get a bowl out of the cupboard so as I can have my breakfast. After that it depends on what we get up to. If we go shopping I help get items off the shelves; if doing the washing I help get in and out of machine taking items out for her. I look after my partner; if she drops anything I pick it up and give it to her. I fetch the post when it arrives. I love to fetch her slippers – that’s fun, and I get the phone. Often she forgets when she is resting to get the phone so I just think “oh not again” and go get it for her! On a more serious note if she was to fall I go into emergency mode and will get the phone or if I have to I can activate the lifeline button to raise the alarm. I had to think about this for a while and nothing is too challenging. I just love doing what I do helping my partner. 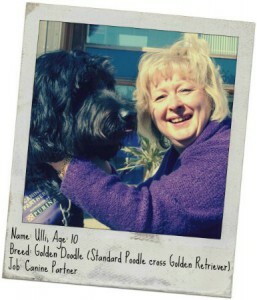 You’re a Golden Doodle, which other breeds have the right traits to become a Canine Partner? I am a Golden Doodle so other gundog breeds like Labradors, Golden Retrievers, Lab cross Retriever, Flat Coat Retriever, Golden Doodles (like me) and Labradoodles. We are all at the right height and build for working with wheelchair users and we have soft mouths and love to retrieve items and bring them to our partners. Lazing around the house in my various beds, playing with my toys; I might be ten but I am still a pup at heart. Having a long sleep after my walks. I love it when I get my stuffed bone and have good chew on that. But most of all I love being invited up on the chair to have cuddles, watching some TV… Oh ok, by that time I am usually fast asleep snoring! 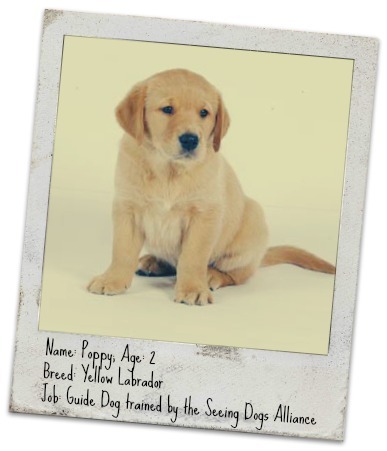 Picked because of her mum and dad’s fine pedigree, excellent health history and temperament, Poppy was trained by the Seeing Dogs Alliance to become the experienced guide dog she is today. Sally lives in a busy place and goes to work each day. I need to guide her through very crowded areas and cope with all sorts of obstacles. How old were you when you began training to be a seeing dog? At six weeks old, I went to live for twelve months with a puppy socialiser. After being introduced to all sorts of strange things like buses and trains during my first year, I then started proper training as a guide and qualified with my blind owner when I was just two years old. 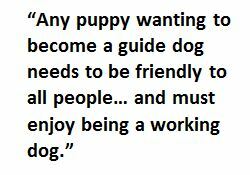 What advice would you give to puppies aspiring to enter your field? Any puppy wanting to become a guide dog needs to be friendly to all people, sound in all conditions, and must enjoy being a working dog. Checks will be made to ensure they are as healthy as possible because the work is so important. Will you ever retire from your job? I hope to work for about seven to eight years and then I’ve been told I will be retired and live as a much loved pet dog with Sally. She hopes to then have another guide dog to continue my work. 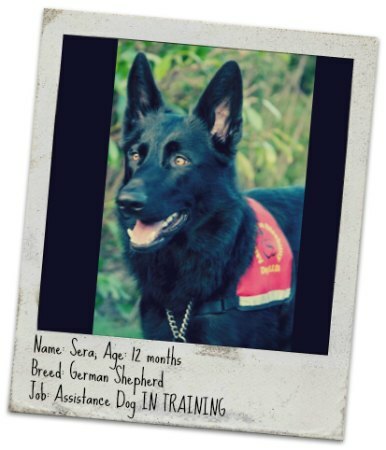 At only 12 months old, the enthusiastic Sera is currently studying on the job to become to become an assistance dog, with the help of DOG A.I.D. Likes: Mum! Tennis balls, my frisbee, playing “find me” in the garden with mum and her friends, clicker training, woodland walks, mud and water… LIFE! At the moment my duties involve making Mum smile as much as I can, she seems to really love it when I’m hanging on her every word but also I’ve noticed that she can’t quite hide her amusement when I gently remove her mobile from her lap and carry it off (it gets far too much attention!) I’m just starting to realise though that I get her to smile more when I bring it back and give it to her. Every day I have home schooling in the form of games (in between playtime and sleep) from Mum and her helpers. A nice lady from Dog A.I.D. comes to visit sometimes and shows Mum how to add to our repertoire. A very important job for me is cuddling up to Mum at night to keep her warm. Seeing the joy in Mum’s eyes and hearing it in her voice when I get a new task right or am quicker at one we’ve already been practising. Did you go to school or did you train on the job? I came to live with Mum at 7 weeks old when she was sad. She said she’d lost a very dear furry friend recently who she’d trained with the help of something called Dog A.I.D. and that I was destined to fill her paw prints. Over the last 9 months she has shown me loads of different sights, sounds, creatures and environments. I figured that if this kind lady was happy, confident and calm in the company of these things, it was ok to just look and learn. Mum says we’ve a long way to go before I earn the right to wear the red Dog A.I.D. jacket in public but I’ve been honoured to be allowed to try one on just for the camera lady and I look forward to having my own and an ADUK ID book in the not too distant future. How do you feel towards cats? Urrm fascinated at the moment but the visitors in the garden won’t stand still long enough for me to investigate. Do you know any hard working, successful dogs? Let us know about them on our Facebook and Twitter! Interesting article about dogs, and life with them. Very interesting, thanks!